When I grew up in Germany, it was just the coolest snack. The kid that had a “Milchschnitte” in his pocket was the boss. You’d pull it out of your sensible parka during break time and everyone would envy you (unless someone else had a kinder surprise perhaps – chocolate and toys combined always win). Those two thin layers of soft sponge and the fluffy white milk filling were just irresistible, only to be shared with the very best friends. It was widely believed to be a healthy option as well. After all, a kinder milk slice contains milk, which is so essential for a child’s development. Well. You can guess where I am going with this. 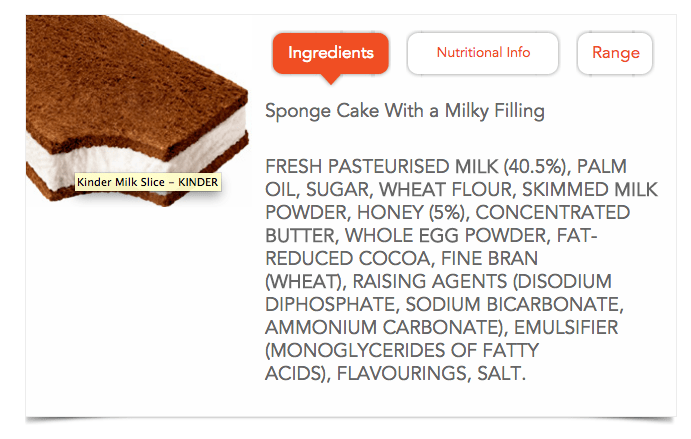 The main ingredient of a kinder milk slice is indeed milk, but the second and third ingredients are palm oil and sugar. One milk slice, according to the website, contains 8.3g or 2 teaspoons of sugar. This may be reasonably low if you compare it to other desserts, but we can do better than that, right? I made my own version of the kinder milk slice by adapting a recipe from a lovely friend who has been making a gluten free version for years. It really is quite simple (if a little messy – or is that just me?). In this sugar free recipe I used the erythritol/stevia blends from Sukrin, who kindly sent me their product range to test. In the chocolate sponge, I tried out their brown sugar replacement Sukrin Gold, which tastes superb and has 97% less carbs than sugar. For the milk filling I chose the Sukrin icing sugar. If you don’t bake, powdered erythritol works much better than granulated, because erythritol does not melt and dissolve the way table sugar does. 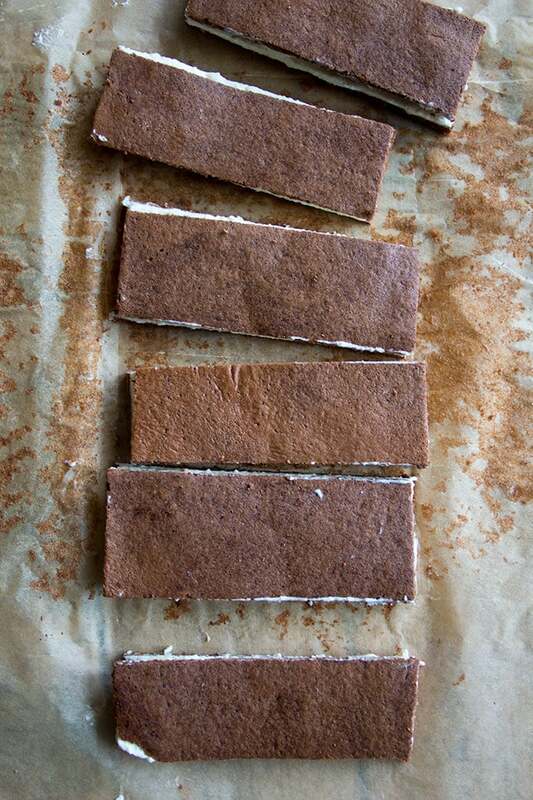 For me the milk slice – Milchschnitte – is part of the fabric of my childhood. Therefore, my version HAD to look as similar to the original as possible. This means you’ll have a bit of cutoffs and leftovers. If you aren’t too fussed about the shape, you could use the rest to make… milk squares. Or milk hearts. Or crumble the sponge over the milk filling in a bowl and call it Eaton milk mess. Whatever you do, this combo tastes nothing short of awesome – just like a real kinder milk slice, only healthier. Enjoy. Want more sugar free sweet ideas? Here are some of my favourites! In Germany it's called Milchschnitte, in its home country Italy it's Fetta al Latte. 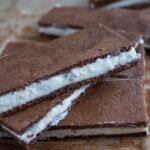 You'll love this sugar free and low carb version of the European cult snack kinder milk slice! Delightfully soft chocolate sponge with a creamy, milky centre - a sweet snack without the carb load. Pre-heat your oven to 180 Celsius. Beat the eggs until foamy. Add all other ingredients for the sponge and mix well. it is essential that you don't leave out the psyllium husk. It acts as a binder and is, very conveniently, super healthy as well. Pour the liquid mixture onto a baking sheet lined with baking paper. To ensure you can easily remove the baked sponge later, lightly grease the baking paper first. Bake for 12 minutes. Depending on your baking sheet, you might have to do this in 2 batches. Remove from the oven and let cool completely. For the filling, warm the milk in a pan (it should not boil) and stir in the gelatine granules until completely dissolved. Whip the whipping cream until very stiff, then add the cream cheese, Sukrin icing sugar, vanilla essence and the warmed milk with the melted gelatine, and combine well. 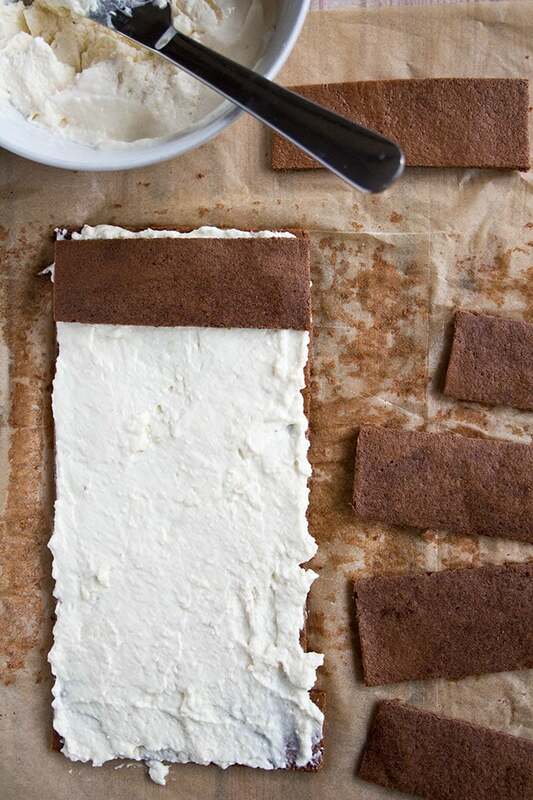 Peel the cooled sponge off the baking paper and pre-cut it to the desired shape. My slices were ca 10 cm long and 4 cm wide. Spread the milk filling over the sponge (ca 1/2 cm thick) and top with the second layer of pre-cut sponge slices. Separate the slices with a knife and serve. Any leftovers are best stored in the fridge. My mix yielded 10 milk slices, however, I did have some leftovers - offcuts, if you wish. Like I mentioned in the text, feel free to recycle them into less pretty, yet equally delicious desserts. It's worth mentioning that the original kinder milk slice weighs 28g and is therefore roughly half the weight of my milk slice. Yet my version has only 1.1g sugar (compared to 8.3 g) and 2.8g net carbs. Any chance changing to coconut flour and adding extra liquid might work? This tree-nut allergy, after 60 years of eating and loving nuts, is so annoying! Hi Toni, I’d halve the amount stated for almond flour and try 40g / 1/3 cup of coconut flour instead. Let me know how it turned out! 100% sugar free but you’re using Sukrin icing sugar? rededit the Post then. Hello there, Sukrin Icing is not icing sugar, it is a sugar replacement made from Erythritol and Stevia. It does not affect your blood sugar at all. It has the same sweetness as sugar and the same consistency as icing sugar. What can I use instead of psyllium husk? Can’t wait to try this recipe! I have not tried replacing it with anything else, so you’d have to experiment. The psyllium husk binds the dough together and absorbs liquid. Maybe you can use ground flax seed, though I find it has quite a particular taste. Or ground chia seeds. Maybe cornstarch? This looks like a delicious snack! I can’t wait to try your healthy recipe! Katrin, that looks so good. The the win of the snack lottery when I was a kid was something called a chocolate ding-dong – basically a chocolate cupcake filled with cream and topped with a chocolate icing. Oh, and cream filled oatmeal cookies. I would have rather had this version of your childhood tasty treat. Thanks for sharing. I quite like the sound of a chocolate ding dong! These look lovely and sweet! I have not had these before either & I think I’ve been missing out! These are so cute! 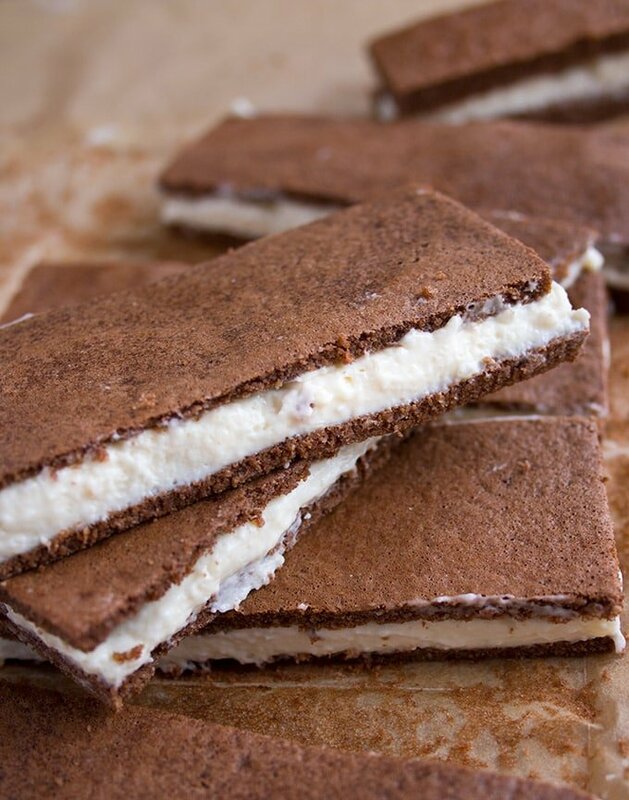 They look just like the ice cream sandwiches my kids love. You poor people in the US have been missing out. But then we never got Taco Bell 🙂 Thanks for the thumbs up!